The most anticipated peripherals in the gaming industry are keyboards, with hundreds of products each having different specifications. The “Mechanical” keyboards are targeted towards gamers and professional typists who can take advantage of the features such a keyboard can provide. The mechanical keyboards have mechanical switches providing durability, faster response times, and great press/rebound feel of the keys. There are a lot of wired mechanical keyboards in the market but not many wireless mechanical keyboards because the wireless connectivity is not the best of the ways to register multiple keys simultaneously and can also lead to slower response times. Also, disconnection during a professional gaming event can lead to an awful experience. However, wireless connections have been greatly improved and that is why new mechanical keyboards having wireless connectivity are rising to the surface. Corsair is one of the most famous brands when it comes to gaming mechanical keyboards. Their K-Series mechanical keyboards are famous for build quality, aesthetics, and comfort. Corsair K63 is no exception. It is one of the only wireless mechanical keyboard Corsair has designed. It comes with Cherry-MX red switches and uses a tenkeyless form-factor. Both of these specifications are entirely gaming oriented making it an attractive product for gamers while typists will have a hard time typing on the linear red switches. The special edition of Corsair K63 comes with Ice Blue colored LED back-lighting and has a beautiful comfortable wrist-rest which can be detached by the user. It features ultra-fast 2.4GHz wireless technology with a blasting response rate of 1ms. Also, 128-bit AES encryption is used in wireless transmission to protect the keystrokes from wireless eavesdropping which is helpful in keeping the data safe. The keyboard also provides dedicated media keys for enhancing the media functionalities. 100% anti-ghosting with N-key rollover ensure that multiple keys are registered correctly if pressed simultaneously. According to Corsair, K63 wireless mechanical keyboard can be used for up to 15 hours at full brightness before it needs to be charged again. At medium brightness, it can serve for around 25 hours while with no back-lighting, the keyboard can be used for up to 75 hours, thanks to the rechargeable Lithium-Ion battery. The keyboard also provides a wired connection for seamless experience to gamers who do not want any interruption during their game-play times. The Cherry-MX switches felt very smooth and swift for gaming and the keycaps were also high-quality. The lighting styles of back-light can be changed with the “Cue” software and macros to any key can also be assigned ensuring customization. The keyboard weighs 2.2-lbs and has a report rate of 1000Hz. An optional lapboard can also be considered if one intends to use the keyboard in various places. Corsair provides a 2-year official warranty in case of any malfunction. We will recommend this keyboard only to gamers as it does not feature tactile switches, which is a deal-breaker feature for typists. Logitech is a well-known brand for all kind of peripherals whether that be a mouse, headphone or a keyboard. 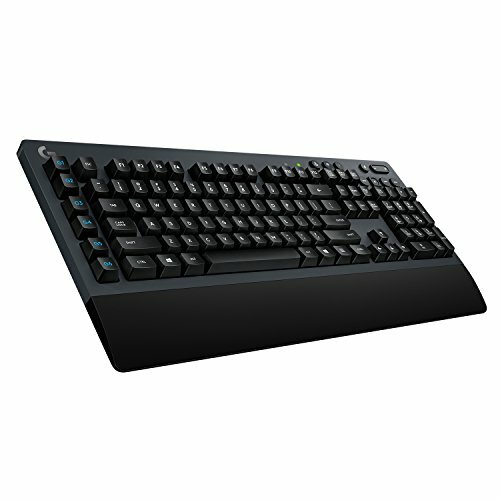 G613 Lightspeed wireless mechanical keyboard is Logitech’s only design for a wireless solution. Lightspeed is Logitech’s wireless technology which provides ultra-fast response times (1ms) with no hiccups. This keyboard uses Romer-G switches which are silent switches, have tactile feedback and need a force of 45g for key-actuation. The key-press life of switches is also good at 70M presses. It also includes an integrated wrist-rest for comfortable use although it is not detachable. It uses a full-size form-factor providing dedicated media buttons and six dedicated macro buttons in case the user wants to customize the button functionalities. This feature not only makes this keyboard attractive for gamers but also professional typists looking for a comfortable typing experience. We felt that this keyboard was quite better than the Corsair one especially in long typing sessions, though its weight is slightly more than that of the K63. Logitech has included two AA batteries providing tremendous battery life of 18 months which makes it one of the most attractive wireless mechanical keyboard. When the battery reaches 15%, both the battery LED status on the keyboard and Logitech software warns the user. The package also includes an extender USB cable to use with the wireless receiver. The keyboard weighs around 3.2-lbs with two AA batteries included which is a bit on the heavier side. Logitech provides a 2-year official warranty for the keyboard. This product is a great alternative to Corsair K63 and it also suits typists as the Romer-G switches are tactile. Moreover, the dedicated macros keys are also very handy in certain games. 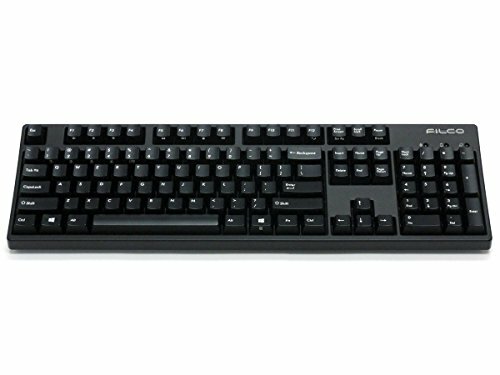 Filco Majestouch Convertible 2 is a premium product mainly targeted at typists. This keyboard has a solid build quality and comes with Cherry-MX black switches. Black switches are great for both gaming and typing due to the high actuation force. However, some people can feel a bit of pain in fingers after using the keyboard for a long period of time. The keyboard can be used with any supported Bluetooth device such as a smartphone etc. There are three modes in this keyboard, the USB wired mode to connect with a computer, the Bluetooth mode while using battery power, and the Bluetooth mode while using USB power. A maximum of four devices can be connected at the same time and toggled in between by use of toggle-keys. There are no dedicated media keys or macro keys to aid in media functionalities or customization. This keyboard provided even better feel than corsair K63 due to premium keycaps, however, the font used is very small which could have been improved. The keyboard provides around 6 months of battery timing when used for five hours a day. It also has a power-saving feature which turns the keyboard off after thirty minutes of no activity. The package includes a key-cap puller if the user wants to replace the key-caps with aftermarket ones. Some extra key-caps are also included in the box if the user damages some key-caps during use. However, the user has to buy the wireless dongle as it is not included in the package. The keyboard weighs around 2.65-lbs which is fine for a full-sized keyboard. It comes with a 1-year official warranty which is a bit low for a premium-priced product like this. 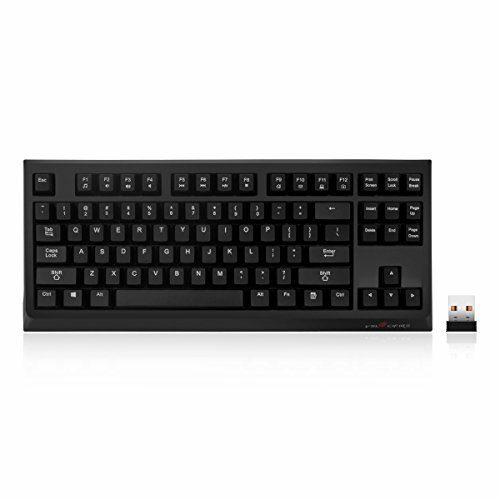 This is one of the only wireless mechanical keyboards which feature Cherry MX black switches, so if you are a fan of these switches then this keyboard will serve you well. If you are not interested in black switches then you should look at some other products listed here. Drevo Calibur 71-key RGB mechanical keyboard is a stunning keyboard with jaw-dropping aesthetics which comes with Outemo switches in four switch colors, red, brown, blue, and black. The keyboard comes with a 60% form-factor which means it neither has the numeric pad nor the function keys. It offers astonishing RGB back-lighting with a total of seven lighting styles which can be customized using the software. It also provides 100% anti-ghosting with N-key rollover which allows the user to press multiple keys simultaneously although a wired connection is necessary to use this feature. It uses Bluetooth 4.0 for wireless connectivity and a USB cable is also provided for wired connectivity. The keyboard can also work with supported Bluetooth devices. 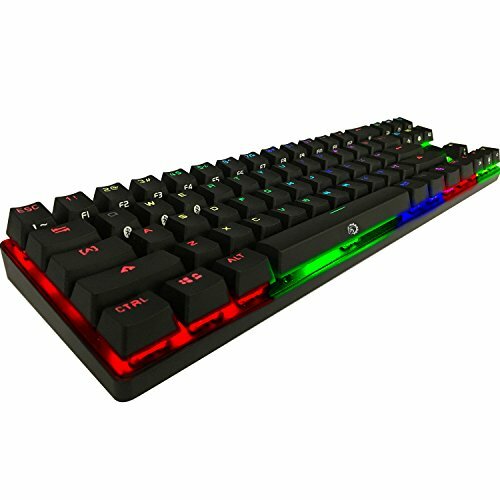 Drevo Calibur 71-Key RGB mechanical keyboard uses a rechargeable Lithium Polymer battery which lasts four days with an average use of five hours daily, though the user can not check the battery status, as no LED is dedicated for this functionality. The sound and feel of the Outemo switches were very similar to the Cherry-MX switches we tested however there was some consistency issue in the switches. The lightning styles were very beautiful and lively, giving a sweet impression. There are no alternative media keys on the keyboard like other compact keyboards which use some letter keys for numeric and media keys. The package includes a key-cap puller for their replacement and two stickers by the company. It is a lightweight keyboard, thanks to compact design, weighing about 1.2-lbs and comes with a 1-year warranty which is fine at such a price. 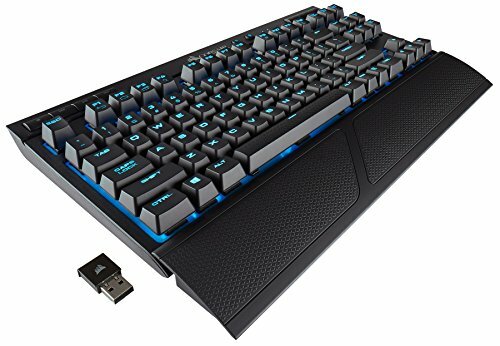 If you want a cheap wireless keyboard having mechanical switches while providing great looks then this might be an intriguing product for you because you won’t be able to find such features at this price range. Velocifire TKL Wireless Mechanical Keyboard is a tenkeyless mechanical keyboard which features Outemo Brown switches and is mainly targeted at typists and programmers because looks of the keyboard are not attractive for gamers. It uses 2.4GHz wireless connection with up to 26-foot range with no signal loss though it can also be used in the wired mode. The keyboard ensures plug-and-play setup and requires no software installment for use. It comes at a cheap price which is why it does not feature back-lighting, which is deal-breaker for some users. It has a polling rate of 1000Hz which is standard for most of the high-end keyboards. Velocifire TKL Wireless Mechanical Keyboard uses a rechargeable Lithium Polymer battery which lasts about fifteen days and there is an indication for low-battery as well. Users can also charge the keyboard while using it. The package also includes a key-cap puller and the USB wire which is used for charging and using in wired mode. We found brown switches to be exquisite for typing and equally good for gaming. Although, the font on the keyboard keys is very simple as it is not a gaming keyboard. The top function keys can be alternatively used as media keys by use of the FN key. At such a cheap price, it is a must-try for people using membrane keyboards. The keyboard weighs around 2.45-lbs and comes with a 1-year warranty. This keyboard is the cheapest product in our list but you should not underestimate its quality. It might not provide back-light or have stunning looks, but it fulfills the needs of a lot of people as such features are not very essential.